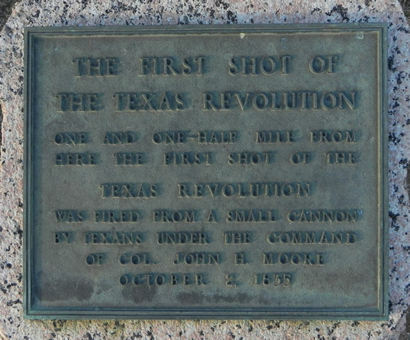 Cost, Texas; First Shot of the Texas Revolution Monument. First known as Oso (Spanish for Bear), the town had its name changed in 1897 when the post office was granted to Samuel C. Hindman's store. 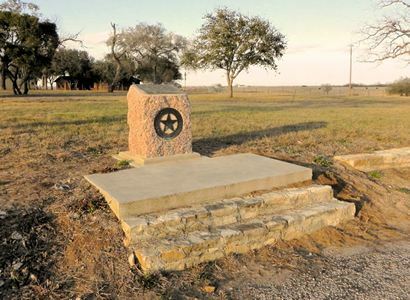 Cost has the distinction of being the town closest to where the first shot of the Texas Revolution was fired in October of 1835. 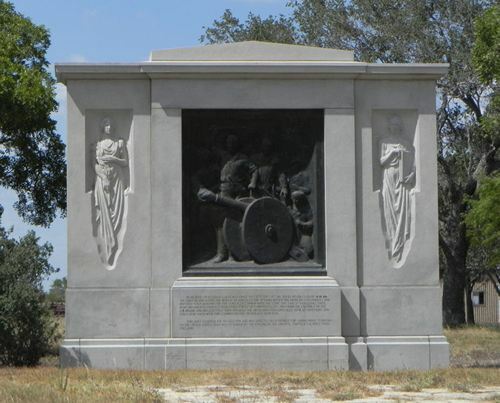 In 1935, Governor James Allred dedicated a monument commemorating this event. 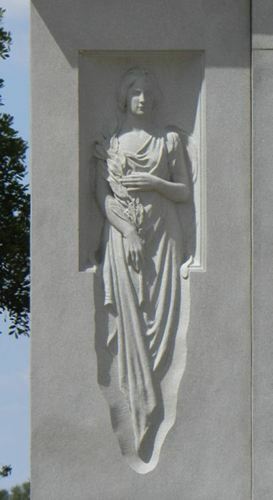 The sculptor was Waldine Tauch of Ballinger (via Flatonia). Sent to study under Pompeo Coppini in San Antonio, Tauch was "adopted" into the Coppini family even though she was already an adult. Her other works can be found in Brownwood, Waco, Canton, San Antonio and numerous other Texas cities. The first business in Cost was a general store opened for employees of a 10,000-acre ranch to the west. A saloon soon followed, but both were closed by 1890. German Cotton farmers coaxed their countryman William Muenzler to move his gin from Fayette County to Oso in 1892. It remained in operation (under only two owners) until 1950. In 1896 Adolph Tolle opened a blacksmith shop, which was sold in 1902. It too, continued in operation (as a garage) until the 1960s. A public school was open from 1897 until it was merged with the Gonzales ISD in 1959. 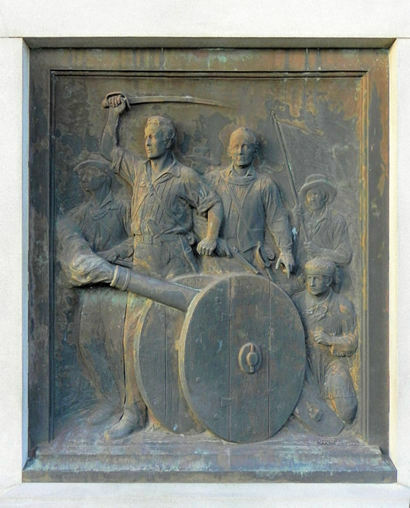 Detail of the bas-relief monument. Follow the road in back of the monument (Spur 95) to the actual site of the skirmish and yet another marker. The boat ramp here has two small piers and makes an excellent put in point, if you remembered to bring your canoe.